As a downtown Las Vegas dispensary, NuWu Cannabis Marketplace, is located in the heart of Las Vegas’ rich history. As the “original Las Vegas,” the history of downtown Las Vegas defines this city — where it came from and how it became what it is today. Located midway between Los Angeles and Salt Lake City, Las Vegas was founded in 1905 on 110 acres of land just off the Union Pacific railroad tracks. The following year, the first hotel — the Hotel Nevada which became the Golden Gate Hotel & Casino on Fremont Street — opened in Downtown Las Vegas. Las Vegas was officially incorporated as a city in 1911. Commonly abbreviated as DTLV, Downtown Las Vegas is the city’s central business hub and historical center. It also predates The Strip as the original gaming district in Vegas. It’s currently home to the Fremont Street Experience, as well as numerous hotels, high rises, historic buildings, new residential developments, and vibrant arts and cultural scene. Downtown Las Vegas has also become home to a blossoming cannabis industry and culture. Since July 1, 2017, recreational cannabis has been legal in Las Vegas and throughout the state. Beginning Oct. 14, 2017, a downtown Las Vegas dispensary again made history. NuWu Cannabis Marketplace opened its doors as the largest marijuana retail facility in the world and the first on tribal lands. If you’re a history buff or have ever wondered about the history of Las Vegas, you’re in luck! We’ve put together this guide for you. 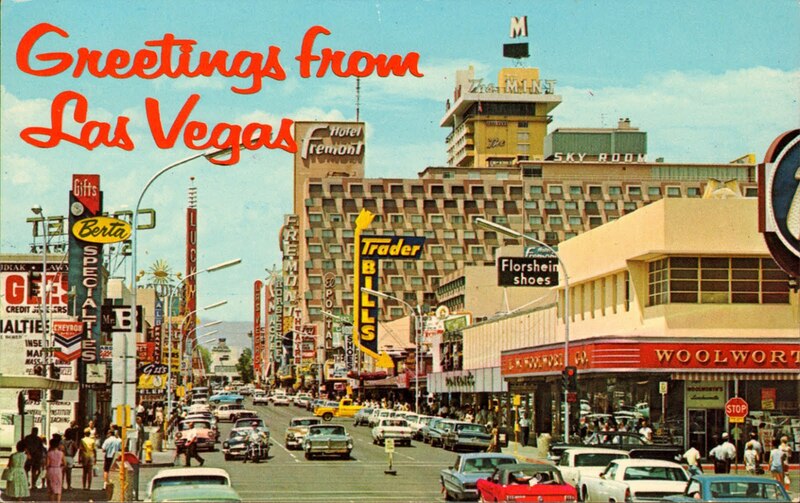 Read about the history of downtown Las Vegas below. The earliest residents of Las Vegas were likely nomadic Paleo-Indians who discovered the area more than 10,000 years ago. At least 2,000 years ago, the Anasazi and Paiute tribes established a presence in the area. Where is Downtown Las Vegas (DTLA) Located? Just north of the Las Vegas Strip, Downtown Las Vegas is located right in the center of the Las Vegas Valley. DTLA spans Fremont East, Fremont Street, and the Fremont Street Experience. Officially, DTLA is defined as the area bound on the north by Washington Avenue, the south by Sahara Avenue, the east by Maryland Parkway, and the west by I-15. The years following World War II were tremendous boom years for Downtown Las Vegas. It was a time that nightlife became synonymous with Las Vegas. Downtown became home to numerous casinos, luxurious hotels, and some of the biggest entertainment acts in the West. Kicking off the decade, Frank Sinatra made his debut at the Desert Inn. The same year, the iconic neon light cowboy, Vegas Vic, was erected at the entrance of the Pioneer Club. In 1956, the Fremont Hotel opened downtown. At 12 stories, it becomes DTLA’s tallest structure. The infamous Rat Pack (comprised of Frank Sinatra, Dean Martin, Sammy Davis Jr., Peter Lawford, and Joey Bishop) began performing. (They would later star in the original “Ocean’s 11”). The Beatles debut in Vegas on Aug. 20, 1964. Wayne Newton established his solo career in Vegas in the early 1960s, also becoming one of the most popular and highest paid performers in the world. Evel Knievel tried to jump the fountains at Caesars Palace. Howard Hughes rolled into town in 1966. Initially, he took over the top two floors of the Desert Inn but ultimately purchased the whole hotel so that he wouldn’t get kicked out. (Hughes left Vegas in 1970, but was Nevada’s largest private employer and largest landowner until his death in 1976). Elvis Presley made his last performance in 1976. He would die just one year later in Memphis. New Jersey legalizes gambling in Atlantic City creating major competition to Vegas on the East Coast. In 1974, Vegas experiences record (unprecedented) snowfall with 9 inches falling in just one night. The face of Las Vegas changed dramatically in the late 1980s. Casino developer Steve Wynn opened The Mirage, the first mega-resort, and casino on The Strip. The 1990s saw a new resort opening annually on The Strip, which put pressure on Downtown Las Vegas, pulling many visitors away from downtown. To better compete, Downtown Las Vegas unveiled the Fremont Street Experience in 1995. A five-block fully canopied area, Fremont Street features 12.5 million LED lights, and 550,000 watts of sound with live music shows from dusk until midnight nightly. As The Strip began to define Las Vegas in the 1990s, Downtown Las Vegas experienced a few temporary setbacks. But, today Downtown Las Vegas is thriving like never before. Years of revitalization efforts have paid off, and in 2012 projects running into the hundreds of millions of dollars debuted in Downtown Las Vegas, solidifying 2012 as “The Year of Downtown.” Some of the attractions that debuted in 2012 include the Mob Museum, the Neon Museum, The Smith Center for the Performing Arts and the Discovery Children’s Museum. Downtown Las Vegas has also recently become home to a thriving cannabis industry. On July 1, 2017, recreational marijuana became legal in Nevada to all residents and visitors over age 21. July 1, 2017, was a huge milestone for the area when downtown Las Vegas dispensary, NuWu Cannabis Marketplace opened its doors. NuWu is the largest retail marijuana facility in the world, the first built on tribal lands, and one of the only retail stores to be open 24/7 and offer a drive-thru.